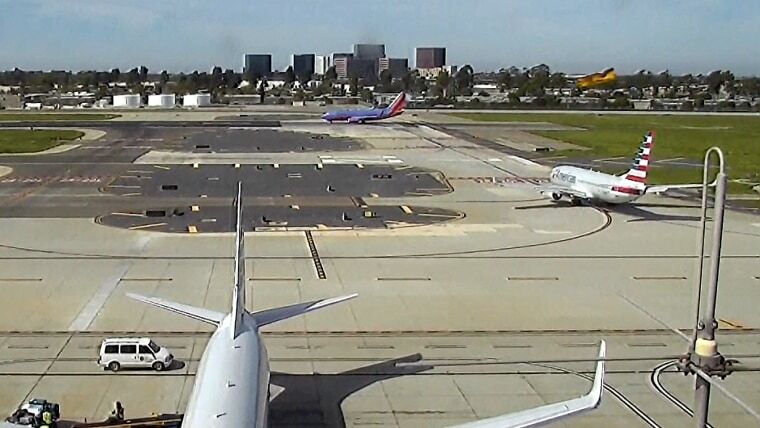 Newly released video shows a plane piloted by Hollywood legend Harrison Ford mistakenly flying low over an jetliner at a Southern California airport. The 45 seconds of soundless footage captured the "Star Wars" and "Indiana Jones" actor's potentially serious mishap at John Wayne Airport in Orange County. In the video released Tuesday, an American Airlines 737 is seen taxiing slowly. Ford's yellow, single-engine Aviat Husky then zooms in from the right of the frame, flying low over the airliner and casting its shadow down the middle of the bigger plane before landing on the taxiway. Ford, 74, was supposed to have landed on a runway that runs parallel to the taxiway. "Was that airliner meant to be underneath me?" Ford asks in previously released audio from the air traffic control tower. American Airlines Flight 1456, with 110 passengers and six crew members aboard, departed safely for Dallas a few minutes later. The Federal Aviation Administration is investigating the Feb. 13 incident. Earlier this month, the FAA told NBC News that controllers gave Ford the proper landing instructions and that he read them back. Ford's publicist has not replied to requests for comment. The star collects vintage planes and has a long and good record as an aviator. However, he suffered injuries when his World War II-era trainer crashed on a Los Angeles golf course in March 2015.